The idea of a VC having its own news aggregator was a bit outlandish in 2007. But Y Combinator was in an unusual position in those days anyway. Startup incubators had been a highly visible part of the dot-com crash, and Silicon Valley was still skeptical of the concept nearly a decade later. So YC set out to be something different — a community of hackers building companies on their own terms. Hacker News was initially built by YC co-founder Paul Graham as a demonstration of Arc, a new programming language he’d been working on. He quickly realized that it could help bring together the companies he was supporting and the rest of the folks who wanted in. With 1.6 million page views and 200,000 unique visitors on a given weekday, it’s now a key part of the venture firm’s success. But the site quickly took off, as former Redditors flocked to it to talk about tech and startups (the site was then known as Startup News). As Graham explains, as the site started seeing traction immediately, he realized this wasn’t just a way to test Arc. He wanted to make Hacker News a place to recreate the way Reddit felt in the good old days, when most of its community was made up of hackers. As Reddit drew more traffic, the hacker focus of the site evolved. The community’s user base became diluted as it grew, and Hacker News was a new home for some of the early Reddit hackers. Reddit used to have a good concentration of startup-related links, but that was because so many of Reddit’s initial users were connected in some way to Y Combinator. Now that Reddit is so much more popular, the top links tend to be images, or videos, or political news. Another goal of Hacker News, says Graham, was to be a place where founders could share ideas and communicate. In the spirit of Y Combinator’s own incubator, Hacker News was focused on being a community for entrepreneurs and founders in the tech community: a place where they could freely post and where Y Combinator could also get to know potential founders and leaders in the tech world. “From the beginning we had a real community, and some of the core group of refugees from Reddit are still prominent on Hacker News today,” Graham explains. Part of what attracted many to Hacker News was its simplicity and voting system. The product’s UI, design and color scheme have remained relatively constant over the past six years. Thomas Ptacek, one of the site’s first users, explains that he was a Slashdot user and then a Reddit user, and flocked to Hacker News (at the time Startup News) because it was more relevant to the technology and startup community. He found Hacker News to be a refreshing change from past forums where the quality of commenting was declining. Here’s how Hacker News works: Users submit links to stories, and stories are ranked according to a voting system, similar to Reddit. The difference between Hacker News and Reddit, however, is the voting system. While you can vote stories up, you cannot vote stories down (but you can flag stories). According to Graham, 100 upvotes will get a story to the top of the front page of the site. You can only downvote a comment if you have enough “karma” on the site, which is another compelling element of Hacker News. The Karma factor is determined by the number of upvotes on a user’s submission and comments minus the number of downvotes. In terms of the design, Graham says he wanted Hacker News to look like your list of processes in a terminal window. The look and feel of the site was aimed at hackers themselves who are familiar with tabular data. Graham will occasionally add new features, some of which are on the backend of the site. For example, as comments get more deeply nested and heated in terms of exchange, the reply link takes longer to appear. There is a purposeful drag implemented on this, says Graham, because deeply nested discussions are rarely interesting. Another subtle feature addition: a flame-war detector. Graham has been consistently deploying and updating proprietary software that determines whether there is a flame war, where people argue heatedly. When these flame wars take place (which Graham says can often get ugly and personal), the story in which the commenting is taking place is moved further down the page. Graham has also created sophisticated spam-detection software, which was just updated with new code six months ago. With the update, Graham says that it’s rare for spam to last on the site for more than 10 minutes. If a user does spam the site or engages in personally vicious behaviors, they run the risk of being banned. But in an interesting twist, called “hellbanning,” the user may not actually know they are banned. In terms of human moderation, Graham himself had been spending three to four hours per day simply moderating the site. And that’s in addition to all of his duties running Y Combinator. While a number of other YC alums have moderating abilities, Graham has been the main human element of the site. “It was becoming my life,” he says. Around six months ago, Graham brought on someone else, who he chose not to name, to moderate the site. He says the individual is affiliated with Y Combinator and is a “prudent and thoughtful guy,” and has been doing a great job ever since. 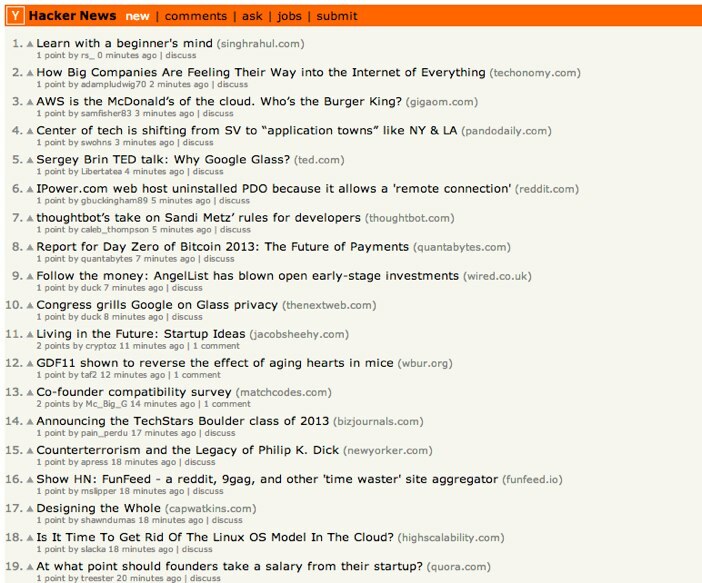 Hacker News has a strong affiliation with Y Combinator, as well. Graham explains that founders usually all create a Hacker News account when they apply, and that user name is the founder’s identity at Y Combinator. Hacker News also features a jobs page that shows any jobs available at Y Combinator companies. He adds that this jobs portal is very useful for Y Combinator, as the majority of the site’s audience is made up of programmers and engineers. If you are a YC founder, your username will show up in orange to other YC founders to enable these entrepreneurs to recognize and meet each other. Graham says that Hacker News gets a lot of complaints that it has a bias toward featuring stories about Y Combinator startups, but he says there is no such bias. Instead, the culture at the incubator is to use Hacker News, and with more than 1,000 YC alumni who have graduated from the incubator, many of these founders are still active on the news site and post links to their fellow founders’ launches and news. Growth has its downside. What keeps Graham up at night is worrying about the dilution of quality of the Hacker News. He explains that the site was community of insiders in the hacker world, and it has gradually been getting diluted. “That is what I spend all my time thinking about,” he says. “The community has been in a perpetual but slow decline because the site is growing,” he says. One of Graham’s biggest pain points is the “schoolyard quarrels” he finds on the site on a daily basis, and wishes “users would stop misbehaving.” He cites the example of users organizing voting rings to purposefully vote up stories, which caused Graham to develop additional software to detect this. He adds that more users are trolling under newly created accounts, and are deliberately starting flame wars on the site. Graham adds that he gets a lot of vitriol from users personally with accusations of bias or censoring. He clarifies that he, and the other human editor, rarely take links down unless they are dupes. Even with tabloid or gossip stories that surface, Graham will not take them down. Users with high karma points tend to flag these stories, he adds, and they can then be taken down. Users are noticing Graham’s frustrations. Ptacek says that he observes that Graham is careful not to tell people what to say or think, but it’s clear that he wants people to treat each other better and he gets more sad over time. While Graham is open about not wanting to be the next Reddit, it’s hard to ignore the fact that Hacker News could be a business. Reddit is reportedly raising cash at a $400 million valuation. While Hacker News has a fraction of the traffic that Reddit does, the smaller site could actually have an impressive valuation as a business without any funding or employees. Graham himself uses the site as his primary source of news. He’s even found Y Combinator companies through Hacker News. A user in the community posted a link to Watsi, a non-profit that allows people in dire need of medical care to raise money for procedures and health care. He noticed Watsi the second time it was posted on Hacker News and thought it was an amazing idea. He cold-called the founders and convinced them to be the first ever YC-backed nonprofit. And Graham recently took a first board seat at Watsi, his first board position ever. But Graham is adamant that Hacker News is not a business and would not become a business. There are no ads on the site, and he has no interest in making money from ads. He admits that through the jobs page he indirectly makes money, as he is an investor in Y Combinator companies and will inevitably profit if the company’s hires help the business. Nor would he be interested in selling the site. While it’s clear that Graham has his frustrations with the community, when he talks about the site’s defining moments, he sounds like he is speaking about his own child. One of his most distinct memories about the site is the day following Steve Jobs’ death, when every story on the front page was about the Apple founder. As for the future of Hacker News, it’s clear that Graham is focused on maintaining quality and making sure that the community treats each other with respect and kindness. “I hope that most Hacker News readers know that I am doing this for their sake,” he says.